Hamster racing is a sport in which hamsters are placed in hamster wheels or hamster balls – often fitted to miniature racing vehicles – and raced down a straight 9 meter (30 ft) course. The hamster crossing the finish line in the shortest amount of time wins. According to a 2001 media report, the world-record time for this course setup is 38 seconds. Events may feature as few as two hamsters or many teams of hamsters and human pit crews. Hamster balls may be simple spheres or feature many design modifications purported to increase the performance and style of the race vehicle. In the United Kingdom, gamblers can place bets on the outcome of hamster races through online bookmakers. In 2001, an epidemic of foot and mouth disease caused the cancellation of some British horse races and other sporting events. To boost their lagging bookmaking incomes, betting agencies introduced and promoted the concept of professional hamster racing. 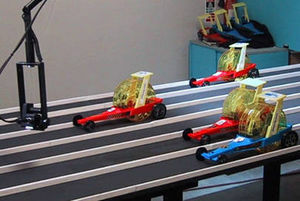 Online bookmaker Blue Square organized the first hamster racing series, with the rodents racing in hamster dragsters. A series of qualifying rounds were held over a week, with a final race. The event was webcast live on the internet and generated significant media interest, including full-page articles in the Daily Mail and Sun newspapers, as well as live reports on BBC London and Sky News. This high level of media interest was in part due to the cancellation of horse racing at the time. While largely confined to the United Kingdom, professional hamster racing has since made inroads in the United States and Asia. Race hamsters are almost always divided into at least two race classes, which follow their species classifications: dwarfs and Syrians. They are also often divided into other race classes, such as novice, patterned and long-hair or short-hair. Not all hamster racing is done professionally or for betting purposes. Amateur hamster races are popular at church outings and frequently occur at hamster and rodent shows. Amateur races generally do not conform to the professional 9 meter (30 ft) track distance but may use shorter "sprint" tracks designed to make sure all hamsters finish in a reasonable time. Fast hamsters are capable of winning sprint races in just a few seconds. In early 2007, Petco announced the return of biannual hamster races in all of its stores. The event is branded the "Petco Hamster Ball Derby" and takes place in late March and early September of each year. The 2006 races featured more than 14,000 amateur race hamsters and their owners in Petco stores across the country. Petco uses a nonstandard short 8-foot (2.4 m) track and hamsters run in common spherical balls rather than the elaborate "drag racers" that professional race hamsters often use (see MTV Sponsorship infra). Races usually only last a few seconds due to the length of the track. Winners receive various prizes such as gift cards, training equipment and hamster treats. In May 2006 MTV began promotion of "HamTrak '06," a world tour of professional hamster racers featuring hamster teams sponsored by The Sun, XFM, Pimp My Ride and others. The first HamTrak race, held on May 19, 2006 at the Hammywood Hills Rodent Raceway, was won by the New Media Age sponsored "Team Hot Rodent," powered by the eight-month-old female Syrian hamster Michelle Schuhamster. It was her 24th career win. One issue that has limited the growth of professional hamster racing is the difficulty in handicapping, or attempting to predict the winner, of a hamster racing contest. As with horse racing, the handicapping of hamsters relies on observations of the speed, pace, form, and class of the animal. However, while many bettors believe themselves to be good horse handicappers, few know what to look for in hamster handicapping as they are unfamiliar with the species. This means that the large population of horse racing bettors are often unwilling to migrate to hamster racing because to do so would require either placing uninformed, pure-chance bets or learning to judge and handicap an entirely new animal. ^ Gardiner, Beth (2001). "Hamster races soothe restless bettors as foot-and-mouth slows action". Boston Globe. Boston Globe Electronic Publishing. Archived from the original on March 3, 2006. Retrieved 2006-05-14. ^ "Petco Press Release, 14 March 2007". Petco. Retrieved 2007-08-14. ^ "HamTrak '06 Official Site". MTV.uk Overdrive. Archived from the original on June 15, 2006. Retrieved 2006-05-14. Betting in Britain has gone to the .. hamsters[dead link] - An Associated Press story reported on Canadian Television news. MTV Brings Racing Hamsters To Screens - As reported on Digital Spy, 12 May 2006. A CNN report from 1998 about hamster racing at a Johannesburg pet show. Punters Turn to Hamster Racing - News report in Dispatch Online, 10 March 2001. Hamster Derby Raises Money for Humane Society - The (Maryland) Gazette Online, 3 June 2009. Durham adventure park stages hamster races - Daily Mail, 20 August 2010. This page was last edited on 12 March 2019, at 03:27 (UTC).